THREE SOLUTIONS TO ADDRESS YOUR STRATEGY DEVELOPMENT NEEDS. Strategy Boost™ is an immediate infusion of clarity and direction to ignite team productivity and performance. We bring our vast experience facilitating complex strategy development to your next group planning retreat, annual board meeting or high stakes decision-making session. Strategy Summit™ is a custom in-depth strategic planning process fully-facilitated by company founder, Cecilia Lynch. Ideal for C-Level leadership, corporations and large non-profits who seek multi-stakeholder collaboration in the creation of a unified organization vision, direction and plan. 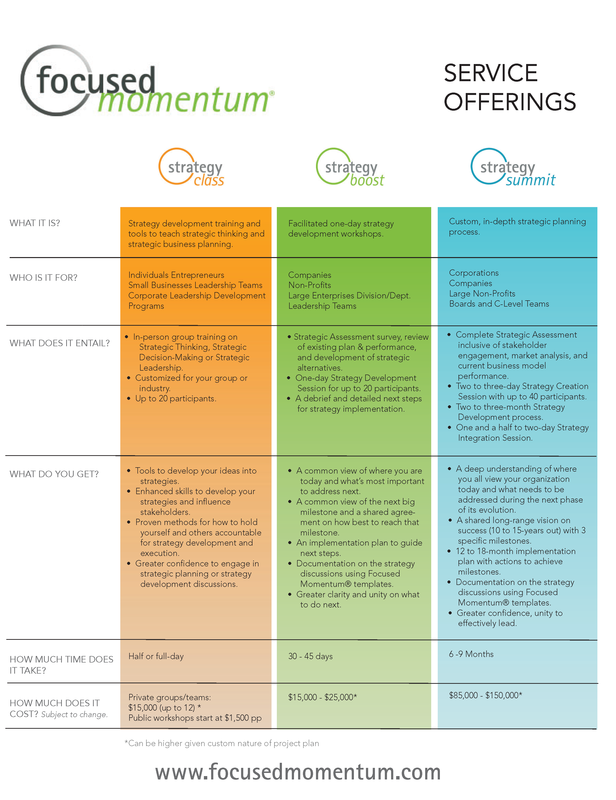 Which Focused Momentum program is right for you?